We are now in our fifth month of the Cottage Cooking Club; a group of bloggers cooking together and then posting our experiences along with the Hugh Fearnley-Whittingstall's cookbook, "River Cottage Veg". Our group is and has been inspired by our dedicated leader Andrea of the The Kitchen Lioness. I prepared 2 of the 10 recipes chosen and once again was impressed by the simplicity and flavor of the finished dish. For the first recipe I prepared the green lentil and spinach soup. Made the recipe exactly as written except I substituted the chard since I have tons of this particular veggie in my garden to clean out. If anyone has followed my blog for very long you know that I am a huge fan of lentils and most any kind of soup. This was very simple and delicious. The next recipe was as easy as can be and titled, Roasted squash". Most any type of squash can be used here and then there are the recommended extras. Roasting veggies is by far my most favorite way to prepare them as this method intensifies the flavor and makes the veggies even more delicious. I know this will be a favorite throughout the upcoming winter months. Recipes adapted from the "River Cottage Veg" by Hugh Fearnley-Whittingstall, first recipe chapter , Hefty Soups, Green lentil and spinach soup, page 162. Roasted squash, page 346. To see what recipes the other members choose for this month head on over to the LYL post for September on the"CCC"
Thanks Von, I did not eat a lot of lentils growing up either, but I really enjoy them now. My husband calls them my hippy food. Fall is finally here and this soup looks like the perfect way to celebrate its arrival. Yay for Cottage Veg! HI Grace, yes! loving this cookbook so far. I am certainly going to love this with those lentila and veggies. Hi Taruna, I love lentils too, thanks for stopping by! Hi Kylee, I'm a big soup person too, especially lentils! Both recipes are Fall perfect. I had some roasted pumpkin today too and have to make some lentil soup tomorrow for the lunch! Thanks for sharing, Cheri. Hi Angie, oh that sounds delicious, pumpkin with lentils! Hi Cheri, I'm not a fan of lentil but I like spinach and pumpkin. I usually steam the pumpkin with rice had made some roasted pumpkin recently. Yes agree simplicity ! HI Karen, I bet that the pumpkin and rice are delicious together! Hi Charlie, yes he does, every single time I have to check my spelling, can't seem to get it right on my own. The recipes are really perfect Fall weather fare. Lovely soup and roasted squash, so simple and delicious. Lentils are just so good for us, need to eat more. HI Suzanne, I totally agree, it's my husbands that balks after too many lentil dishes in a row. This looks like the kind of soup that my family regularly eats in winter. Perfect to have simmering on the stove when people are coming and going, and a meal in itself...lovely! Thanks Sam, that's the way we love to eat too! I'm also impressed by how little effort is required to make these flavourful dishes. I made the soup as well and enjoyed it but I love your squash with the rosemary and roasted garlic - great idea for the butternut squash I just bought. Hi Zosia, the squash worked out great for me as time was such a big factor this month, had fun! Hi Phi, love that it is fall! I just rediscovered my lentil love. This looks great, Cheri! Cheri, absolutely delighted that you participated again this month and really enjoyed the wonderful Puy lentil and spinach (chard) soup and the wonderful roasted squash. Thank you for being part of this wonderful online cooking group! Thanks Andrea, it was another fun month! We are heading into salad weather but lentil anything is good all year around. Hi Mandy, I am one of those people that can eat salads and lentils all year round. Happy Tuesday to you! oh! i totally love lentil! This soup looks so good! I'd die to make it! I must check if i have any lentils left in my kitchen;) thank you for the recipe! Hi Marcela, so sweet of you! Thanks! This soup looks lovely and I like the sounds of this cookbook. Hi Amy, love this cookbook, most of the recipes are very simple and delicious! I love that cookbook! Both of the recipes sound good, like perfect fall choices. Hi Beth, it is a great book for sure, love that the weather is starting to change. I love the idea behind the cottage cooking club - and both these recipes sound wonderful! Thanks Shashi, it is a lot of fun! I used to love making Greek-style lentil soup ... so healthy - and economical, too. I love that you've added spinach to yours. It's a like a super-soup! HI Helen, love the name super soup, makes it sound even better. Love these recipes, especially the roast squash look delicious!! Thanks Gloria it was delicious! 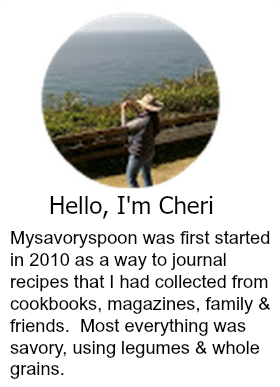 Great recipes Cheri, especially the roasted squash, it sure looks divine! Thanks Mike, we really enjoyed it! delicious choices, cheri! Lentils are one of my favorite foods, but for some reason, I didn't pick the soup. Now that the weather is cooling off, I should add that to my list to try. You make it look great. Thanks Betsy, lentils are one of my favorites as well. Wish I would have prepared what you did as well, the mushroom risoniotto looks delicious too. I'd love to try that green lentil and spinach soup! YUM! Thanks Liz, it was delicious! I love lentil soup, and it sounds great with the spinach! The roasted squash sounds so good too! Thanks Nancy, I'm a big lentil fan as well. I love lentils, but I totally love roasted squash. Even when I was a kid and my mom made frozen mashed acorn squash. I'd put a little salt and butter on it and was a happy camper. So give me squash. I love it! Hi Abbe, squash in lentil soup is great too, thanks for stopping by. Thanks Julie, we really enjoyed them. You could really get into those lentils! Or I know I could! Hi Uru, lentils are my favorite! I love lentil soup, and with spinach? Yes, please. Although I'd probably substitute Swiss chard -- we've got tons in our garden! Hi John, we had tons of Swiss chard as well, so glad you guys are back. Sounds like a fun group to be in! This soup is fabulous and I'm with you on lentils - and so good for you, too. HI Robyn, having a time getting back into the swing of things, thanks! I love that lentil soup. Wish I'd picked it, too, although the chili was REALLY good. And roasted squash? I'm always game for that! HI Coco, we loved both dishes, having fun in this little group of ours. Thanks! I love cooking clubs and especially love simple but flavorful recipes. I'm with you on the lentil bandwagon - love those tiny legumes :) Have a great weekend! 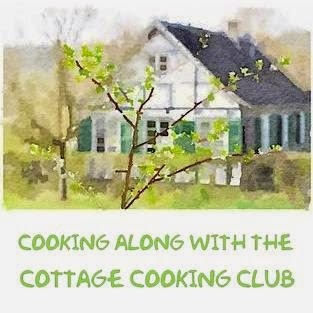 Hi Tricia, this is the first club I joined and it is fun cooking along with others. Have a great week-end yourself! Two great recipes...I love lentils too, in salads, soups and sides. And roasting increases flavors so much. Good choices! Hi Barbara, your so right roasting is the best. I want a big bowl of that soup! IT seems so simple, yet so tasty. Thanks Joanne, it was tasty! I'm a huge fan of lentil soups also! I rarely prepare veggies any other way than roasting anymore. It really brings out a wonderful flavor. Hi Susan, I agree, roasting veggies really brings out the flavor. I made both these recipes as well. Enjoyed them both. Simplicity at its best! Hi Cathleen, you did such an amazing job with all the recipes, you definitely put me to shame. Hi Bam, your so right, time is the best friend here. Lentil soup is one of my favs, and I'm in the mood for a big pot of some comfort food. A trip to the farmers' market is on my list for today so I'll pick up some veggies. Have a great weekend. Hi Cathy, lentils are the best. Love farmers markets. I spent the morning (Saturday) reading everyone's CCC Posts and loved the variety of September choices - the comments will help me alot as I try the various recipes. I did some August choices and then the Salade Nicoise so I am interested in everyone else's ideas. It's already snowed in Aspen so I am ready for soup - yours looks yummy. And, we have all different kinds of squash at our local Farmer's Market so will grab one of those and make the roasted squash. Hi Mary, it is so interesting how we all prepare the same recipes and the interesting twists that they turn. Thanks for stopping by. I love both of the recipes you chose…they sound wonderfully yummy! I really have to get back to this book. I'm missing so many delicious recipes! Hi Kathy, love this book! I love lentils, and it's good to know that this soup is a great recipe. Now that it's a little cooler, I will have to try it! Yours looks delicious. I'm with you on the roasted squash as well - always a great dish, and so easy to make! Hi Candy, another great month in the cooking club for sure. Lentil soups make for such a satisfying meal. Yours looks fantastic! Thanks Ela, appreciate the comment. Love that book! The soup sounds so good. I'm a huge fan of lentils too! Hi Lisa, me too, lentils are the best. I too am a huge lover of lentils! We had a big party here last weekend and served a big lentil salad as one of the dishes. It was such a big hit! And totally agree with you on roasting vegetables. Absolutely the best way to go for maximum flavor!! We loved the lentil soup. It's just the sort of thing I love when the weather gets cold. I'll have to try his method for the squash, now that they're in all the stores.